Raj and Marie live in an ex-council house in a Northern city. Raj works for the council in IT. For the last few years, Raj has been struggling with his job. He has had periods of sick leave and has been treated for depression. A few weeks ago he was diagnosed with early onset dementia. His GP has told him that there is no treatment and has referred him to social services and put him in touch with a voluntary organisation that supports people in his situation. Raj is worried that he may need to stop work. Marie works part time and they need the income for their children to go to university. Raj likes to cycle and he is worried he may have to give this up along with driving. 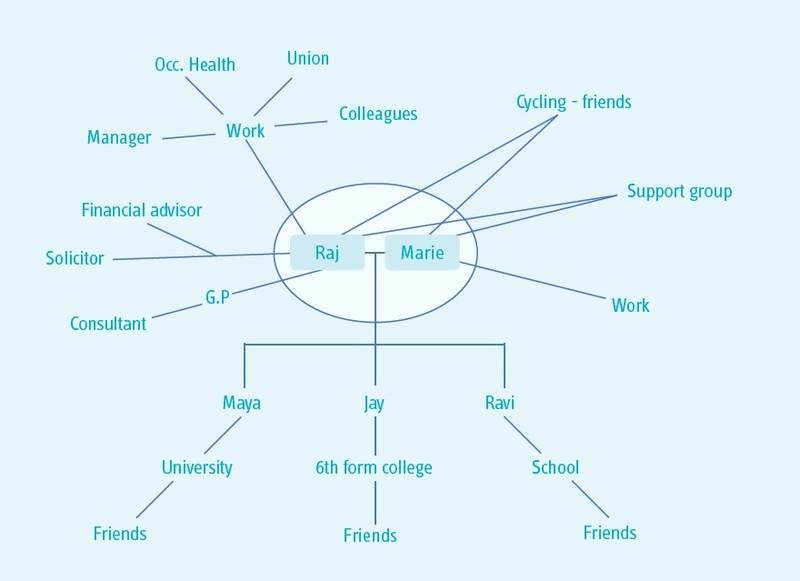 Recently Raj and Marie have been finding it difficult to communicate and to support each other. The diagnosis has made things a lot clearer but they have no real idea what will happen now. You go out to do an assessment for Raj to identify how to maintain his and his family’s wellbeing, and to look at preventative support. It is important to me to understand what is happening now that I have been told I have dementia. For months we were told it was depression and to be honest I thought so too. I’m worried I may not be able to do anything but I do want things to be as normal as possible. I’ve always been resourceful and just got on with things. I want to keep working and support my family. We need the income apart from anything else. I’m worried about Marie because this has all been difficult for her. I’ve not been myself for quite a long time. We’ve been married for 23 years and we’ve always looked after each other. It’s important to me that the children aren’t distracted by me being ill and are able to do well at school and university. We’re trying to keep things going as normal, as much as we can. I’ve had a few days off work after I was diagnosed. I’m going back next week for half days and I’m going to see Occupational Health. I haven’t told anyone except my manager – none of my friends or colleagues know. I’m not sure what to say to them. Marie has been going to work part-time as usual. The children are carrying on at school and Maya’s at University – she came home for the weekend. I can’t even think about what the children must be going through. I can see that the boys are trying to be cheerful. I’ve not been out in the car or on my bike since I saw the GP. I don’t feel confident enough at the moment. Marie says I need to take each day as it comes as it’s been such a shock. She’s trying to be very calm about it. I’m a bit all over the place at the moment. Some days I’m ok and others I just don’t know what to do with myself. I feel well but I know that my mind is not as it used to be. It’s very frustrating not knowing what will happen and when I will get stuck. I don’t really feel like going out at the moment. I keep thinking what if I forget what I’m doing. The doctor said that there’s nothing that can be done about my illness; there’s no treatment. So I want to make the most of my time. I don’t know how this will pan out. I want to keep doing things as long as possible. It would be good to not feel so anxious about the future. I worry about how my wife and children will view me. I don’t want them to see me as a burden. I don’t want my daughter to feel she has to look after me and her mum. I don’t want to lose the relationship with my wife. It’s not been easy the last six months. I think we do need a bit of support. This is such a big shock for us. I was given the number for a charity to talk to but I’m not sure about going somewhere where everyone has dementia. I do want to talk to someone who knows about dementia. I’ve looked on the internet and there’s lots of information but I’m not sure what applies to me. I do want Marie and the children to have some support too. I know our friends would rally round but I don’t know how we’re going to tell them and I don’t want them thinking about me as ill or dying. I need to sort out our finances and make sure we’ll be ok if I have to stop work. It would be good to know what the options are for the future. I want to stay well for as long as possible but I know that I might need some care at some point. Marie and I have always managed to deal with whatever happened to us. We are both quite resourceful as there’s always just been us. We have a good relationship. I think once we have the information and have had a chance to make sense of what is going on, we will be able to find a way through this. Marie and I both work and we have a bit of money saved. We can get advice about how to manage financially and we should be able to cope. I think the council (where I work) will be supportive about any help I might need to keep working as long as I can. The children have good friends. We are a close family and we always talk about things so that should help. Our friends will probably want to help once we have worked out how to tell them about this. We have good neighbours and know quite a lot of people in the community so we can think about letting them know in the future. I think they would also want to help if we needed it. Raj and Marie are having to adjust to a significant change in their circumstances. They have strengths and networks to draw on to support them. However, they will benefit from additional advice and information, and specific support for people in their situation. Having the opportunity to plan ahead now will help to maintain their wellbeing as things change in the future. They will benefit from greater understanding about what is likely to happen as time goes on. They also need advice about work and finances. It is likely that Raj will need additional support in future. He and Marie can come back to the council for a further assessment when they think that they may need additional help to manage day-to-day activities. They can either contact us directly or go through their GP or ask the dementia support group to refer them. The assessor will have access to this record. Raj is not currently eligible for care and support under the Care Act 2014. I have explained that this is because he can currently manage day to day activities. However, the council has a duty to offer advice and information, and preventative services. We have agreed a plan (see care and support plan document).